Let’s face it. It’s nice to get a virtually rendered 3-D image of your new kitchen before the fitting has even begun. Specialist Computer Assisted Design (CAD) software is evolving year upon year. Now, you are able to see a photo realistic example of your new kitchen, complete with desired lighting and chosen appliances. From this, you can identify areas of the kitchen that may not aesthetically please you – rather than reading through a never-ending list of units. At KAW Interior Design, we use ArtiCAD Professional. One of the industry leading pieces of software, combined with our top-spec computer equipment we are able to render lightning-fast HD images for customers to enjoy. 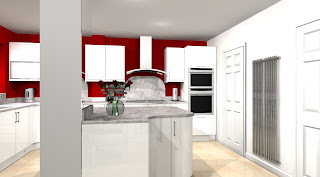 It has become quite important for customers to see just how their CAD representation matches to the finished project. Mr & Mrs Burtoft actually talk in their video testimonial about how close the images were. You can see this here. OK, so now on to examples. First up we have Project Thorogood. Our lead designer, Kevin Walsh, took the photographs in roughly the same place as he had rendered the CAD images, so we can show just how close we got to the initial design. The first picture is the actual kitchen. The beautiful, specially-sourced worktops gracefully compliment the contoured lines of the island, and the captivating high-gloss doors and cabinets. The red walls help push the shine of the gloss into the viewers eyes, whilst the worktop makes it hard for anyone to take their eyes away from the hypnotic beauty. To fully understand the work involved in this transformation, look at this album for before and after images. Next up is the CAD image. You can instantly see from the outset the similarities between the two – right down to the exact detail of the worktop. This pictures shows just how much a CAD image can be trusted for reliability; It is such a fantastic way of understanding, realising and tweaking the fundamental elements of your kitchen, before you spend a large sum of money on a design that isn’t quite perfect!